Cranky Fitness: Too Many Vitamins--Link to Prostate Cancer? Not having a prostate, Crabby probably didn't take sufficient note of this study when she was skimming through headlines a week or two ago. She suspects the percentage of prostate owners among her blog readers is probably in the 5-10% range, and being selfish, she tends to pay more attention when a study mentions breast cancer than prostate cancer. For this she apologizes but she probably won't reform anytime soon. But the implications of this study are troubling for those who take lots of multivitamins. Researchers found: "an increased risk of advanced and fatal prostate cancer among men who used multivitamins more than seven times a week, compared with men who did not use multivitamins. The association was strongest in men with a family history of prostate cancer and men who also took selenium, beta-carotene, or zinc supplements." We've gotten pretty used to studies telling us that we can't get all the benefits of healthy foods like broccoli by taking a pill. But it's kind of creepy to discover that too many multivitamins might actually increase certain cancer risks. There is also some evidence (still under debate) that for smokers, beta carotene supplementation may actually increase risk of cancer. Studies like these almost seem to make some whole-foods advocates happy. "See," they say, shaking their heads and making little tsk-tsk noises. "We were right. You have to eat your carrots and your broccoli after all." But though Crabby believes whole foods are best, she isn't happy about this. She too wishes there were more short cuts. She's tired of reading cheerful magazine articles touting the health benefits of some obscure vitamin or mineral, then telling her that in order to get enough of it she's going to need to eat 14 servings of oat bran, twelve cups of anchovies, or eight glasses of carrot juice a day. So Crabby is eagerly awaiting news that they've discovered a pill that will turn the food groups on their heads, requiring us all to consume more hot fudge sundays and fewer cups of brussel sprouts. However, as that day is not yet here, Crabby will dutifully eat her vegetables. And for readers who like to leave the occasional comment but find this post just too darn boring, take note of the previous post: about two thirds of the way down, Crabby got "called out." Many may well agree with accusations that Crabby is far too fixated on superficial matters such as Google and Site meter. Feel free to chime in there and Crabby may get around to responding officially to reader grievances in a future post. Or you may continue the discussion in these comments--Crabby is quite flexible, for a crab. I think this study is really a wake up call. Vitamins are great actually. Most of the men who developed the cancer were taking mega doses of the vitamins. As with anything, you can get too much of a good thing. Eat too many carrots and you'll turn orange. Other wise carrots are a great food to eat, just not in mega doses! It is boring ole' moderation that is important! Samantha's right. Moderation is the key. Our quick fix world is a large part of the problem. If a little bit of something helps, then a lot of it will do more quicker. Do not fret, Crab-Crab (is it okay if I call you that?.) Back in the eighties I joked to a friend about lobbying to make chocolate a health food. Now that it is, and dairy is good for you, then logically hot fudge sundaes are already health food. It's quarter past six in the morning here in kiwi-land. Is that too early for a hot fudge sundae? 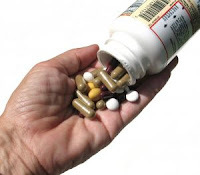 It seems to me that you're dammed if you take supplements and dammed if you don't! Thanks for the mention yesterday, Crabby. I'll try not to become a health hazard! I am only a couple of years away from starting routine prostate exames. Ugh! It used to be so far away, now it seems so close. Anyhow, I eat my fruits and veggies as well as the vitamins. I am not too worried about getting cancer from it as I don't take the mega-mega-giga pack of vitamins. Samantha--as usual, the voice of reason. (I had a friend in college who turned orange from carrots. I don't mind them, but I don't like them enough to have to worry about it). Leah--if I can call you "goat" on occasion, you can certainly call me Crab-Crab. And I like your idea of hot fudges sundaes as a health food! Hi Dawn--it's never too early for a hot fudge sundae. You just have to lift a few extra cans of beans later in the day. Okay, a few hundred extra. But it's worth it. Half-man--Okay, here's how dumb I am, it took me a second or two to get the joke! And sounds like your approach to veggies and vitamins makes good sense. I'm not entirely sure what's involved in the prostate exam, but I'm glad it's one I get to skip. (Though our yearly ob/gyn appointments aren't too amusing either. Stirrups are better left for equestrians, in my opinion). What's up Crabby...Just letting you know I posted some props for you and a link to this blog. I always like to let folks know when I link to them... I'm a big fat lier. I like to let approachable bloggers know when I link to them. Scary, famous, bloggers I leave alone. You mean drink them? I thought they were suppositories?